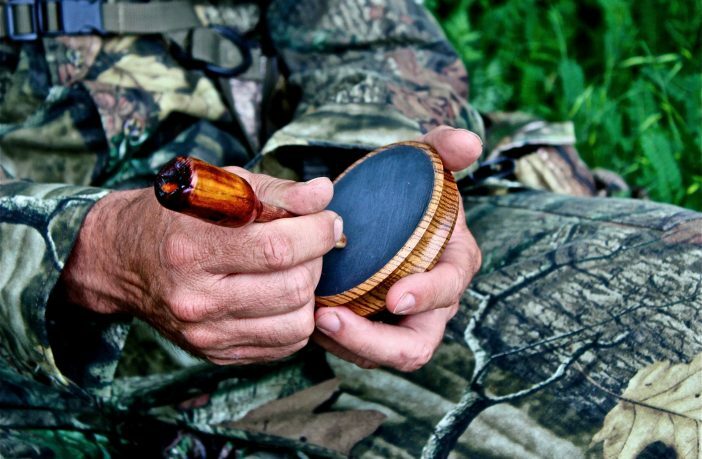 The best way to lure a gobbler into range is with a wide range of turkey calls. Turkey calling is an art unto itself and takes plenty of practice to get right. Spring turkey season is unarguably my favorite hunting season of the year. There’s just something special about sipping coffee in the darkness of the early spring morning, and waiting for the sun to rise. Unlike deer season, you are wearing light, comfortable clothing but completely hidden in the camouflage you wear. You start to hear eerie gobbles in the distance and the occasional “whoosh” of large wings as a bird flies down from its roost. Then, as the first light breaks, you hear the crack of a shotgun. It’s on! Hunting turkey is a unique experience for many reasons. One of them is the design of the large bird and its senses. Turkeys don’t have a great sense of smell, but their eyesight and hearing are incredible. Turkeys can spot minor movements at several hundred yards. What is most amazing is that the eye placement gives them vision that spans almost 360 degrees. That means, it pretty much has eyes in the back of its head. More importantly, turkeys have an incredible hearing power. They can notice even small irregularities in the sound of a call. They can exactly pinpoint the place you belong to based on the sound you make. A gobbler might be 150 yards away, but they can tell if you move 20 feet between calls. This is both to help the animal avoid predators and also find mates. The best way to lure a gobbler into range is with a wide range of turkey calls. 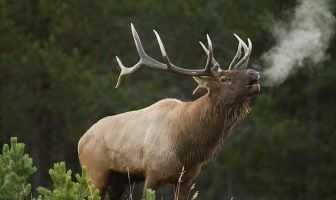 For a beginner hunter, learning how and when to call can initially be a frustrating endeavor. Turkey calling is an art unto itself and takes plenty of practice. Here are some tips to get you started. The key to perfecting your call technique is practice! The more you practice, the better your chances are for achieving success. If you haven’t tried calling before, you are going to need some practice before going into the woods. If you know a friend who turkey calls successfully, call them up and ask for a lesson. Listen to other callers’ techniques on YouTube or similar platforms. Watch as many different videos as you can to get a feel for how the experts do it. The more you practice, the better your chances are for achieving success. We will discuss different types of calls in the sections below. As you begin calling turkeys, you want to make sure that you are careful about any other noises that you make. A little rustling in the leaves is fine as that could sound like a turkey, but nothing metallic or unnatural should be heard. As a general rule, you shouldn’t start calling until you hear gobbles or hear a bird fly down from the roost. Any calls that are too early may be assumed to be artificial. Position yourself close to a roost tree so that you can time your first call perfectly. A big rookie mistake is simply calling too often. Make sure to be patient with your calling and play hard to get. A big rookie mistake is simply calling too often. Anxious calling can make a gobbler think that a hen is coming to him. This will cause the gobbler to stay put. In some cases, if you hear a gobble and then respond with a call, the male will be in your range within a few minutes. If they stop just out of range, then you can use another call to draw them in. Make sure to be patient with your calling and play hard to get. Turkeys rarely stay in one spot. This means that several calls from one spot have the potential to sound artificial. It’s a good idea to get up and move about 20 feet from time to time to ensure your calls sound more realistic. Just don’t let the turkey spot you while you’re relocating. This type of call is the easiest to learn. Push-button calls make realistic yelps, clucks, and purrs with a push of a button. Some calls have built-in volume and tone adjustments. Unfortunately, these types of calls are sensitive to moisture. Rain can effectively silence a push button call—not ideal if it is your only method of calling. Mature turkeys may also be less responsive to push-button calls due to the amount of pressure they’ve received from similar calls throughout the season. This is the call that I use most often, and what I used on my first hunt. My grandfather gave me his box call that he made himself. This wooden call consists of a box with a flat slide loosely attached to a screw at one end. This allows the slide to rotate across one lip of the box. The friction makes an accurate hen sound, especially if you add chalk to keep the surface dry. Unfortunately, box calls are worthless when wet and most of them require two hands to operate. This is my father’s favorite turkey call. It consists of a slate and a stick with a blunt end for rubbing against it. I have seen my father make some more subtle sounds with his call than I can with mine. However, it still must remain dry and requires two hands to operate. This call has become very popular with modern hunters. It is a simple foam mouthpiece with latex or rubber reeds attached. It fits in the roof of your mouth. You then use puffs of air along with your mouth shape to create different sounds. I was quite good with mouth calls as a boy, but I am out of practice and have reverted to an easier method. Mouth calls keep both of your hands free, so you can call and shoot at the same time. However, making accurate call sounds takes a great deal of practice. Gobble calls are typically shake calls that replicate a gobble when shaken with one hand. Some hunters like to use the aggressive nature of male turkeys to draw them in. Turkeys in mating season will defend their hens and their location. The sound of a gobble can sometimes get the largest and oldest gobblers to come running for a fight. Gobble calls are typically shake calls that replicate a gobble when shaken with one hand. I have actually gotten pretty good at doing a gobble call with no device at all. It just takes some practice. You might wonder why the sound of a crow or an owl would help with turkey hunting. Often, these locator calls can draw out a gobble to help you locate a turkey early in the morning or late in the evening. This is perfect because the turkey will not change location but will respond. It can help you find a roost tree opening morning or when scouting. When calling as a hen turkey to draw in a gobbler, you have two primary sounds that you want to make. The backbone of your calling and the sound you should perfect is the “yalk.” This typically is done several times starting slow and then getting slightly faster. I normally will “yalk” four or five times and then wait at least 15 minutes. This is the sound most likely to draw in a gobbler. The other sound that you can make is a light “cluck.” This is a much softer sound designed to help draw in a tom that is being stubborn and staying out of range. The number is not important, and you want the pattern to be a bit random like a clucking chicken. As long as you remember the advantages of the turkey’s senses, you will do well. Very few animals have the hearing that a turkey has. Do everything you can to use these strategies and keep your sounds realistic. With some quality calling and a little luck, you will bag that big tom. Managing Editor at Today's Hunter. Copyright © 2019 Today’s Hunter.